This year we did it the Norman way. 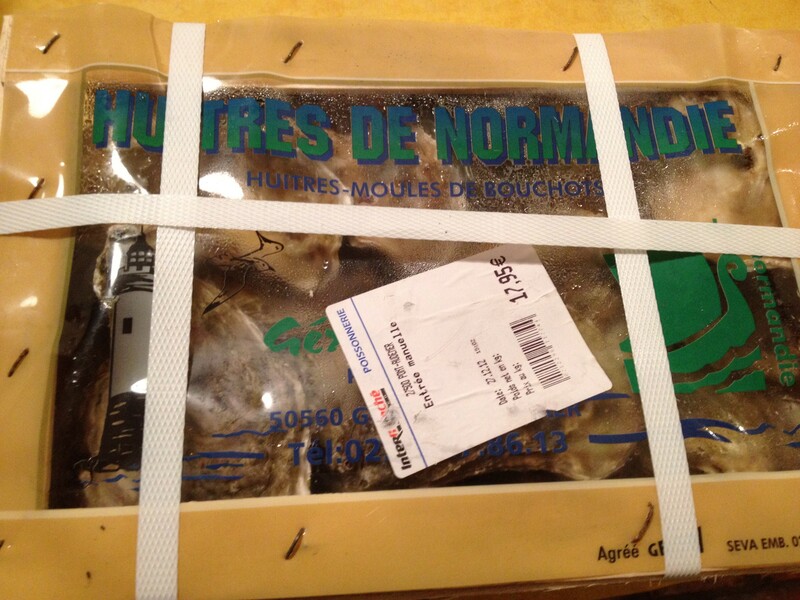 The local oysters came from the supermarket, of all places–but only after a protracted discussion with the fishmonger about just how fresh the oysters were, and how to store them, and what size is best (2 is larger and better than 3). Oyster knives were secured, space was made in the fridge, and the last evening of the year was celebrated with oysters, champagne, foie gras and prune-stuffed pork loin (based on a Jane Webster recipe). I’d wanted to do it this way for a long time–you see the oyster boxes piled high at market in December–but didn’t know how or have the confidence to do it alone. We had keen company: she had holidayed in Brittany as a teen, and remembered the men wearing oven gloves as they swore at the boxes of recalcitrant oysters. He claimed to have shucked oysters “once or twice”–know that an Englishman always understates his skill. The oysters were prepared, kept cool over ice and served with lemon, vinaigrette and scallions. Perfect. 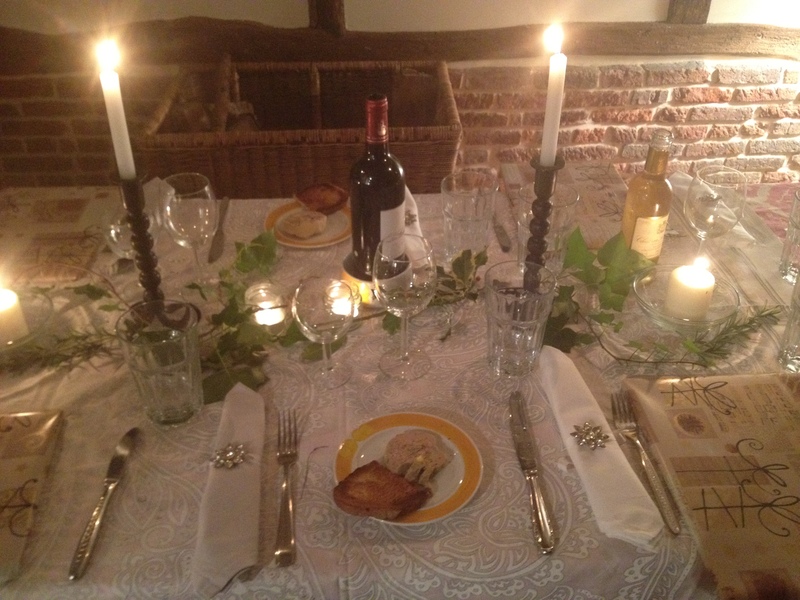 I went a bit Martha Stewart on the New Years Eve table using bits of ivy, mistletoe and rosemary from the garden. 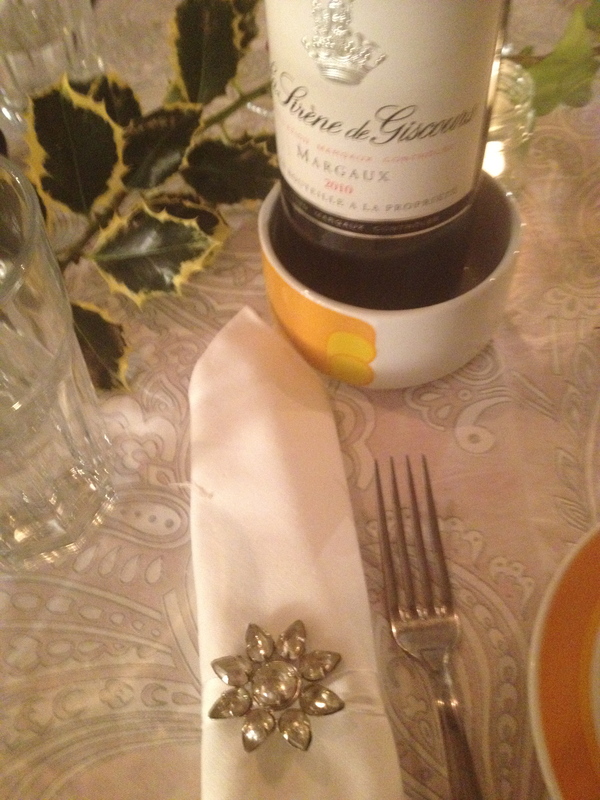 The silvery tablecloth is from Zara Home, and extra sparkle was provided by our guests in the form of a hostess gift (as if the shucking weren’t enough), these gorgeous festive napkin rings from The White Company. The next morning the Seine at the end of the garden was as perfect as it can be. It had gone all Monet, reflecting the trees and clouds so that even the most unpainterly among us couldn’t miss the mirror effect. 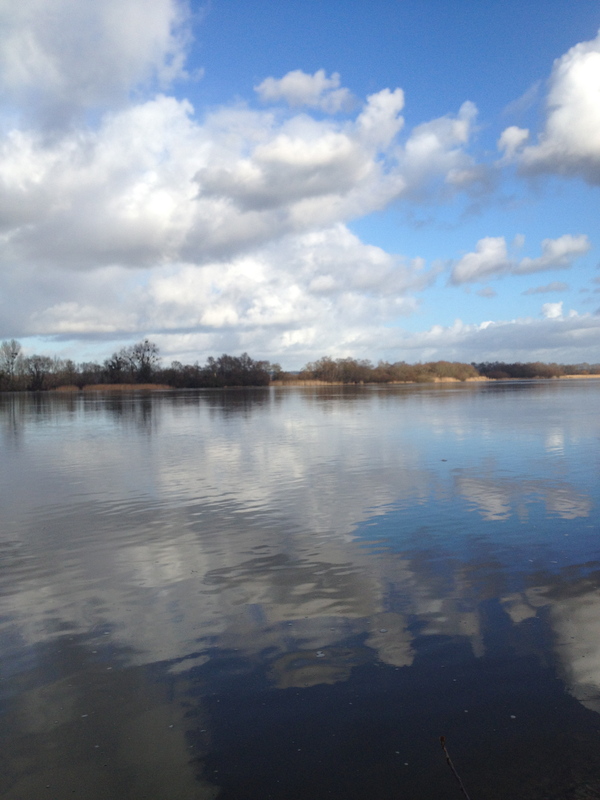 In 2013 two of the major events in Upper Normandy will focus on the Seine. The Impressionist Festival from April to September will put on six exhibitions and many activities on the theme of water in Impressionist paintings. The Rouen Armada in June will host tall ships along the Seine from Le Havre to Rouen. No better way, then, to start the year than on the banks of this great, beautiful river. To start the new year, I am re-posting from last year on the Norman tradition of a cool dip on New Years Day. Just a fastastic way to start the year. Is there a good way to start the new year? Celebrate midnight in style, and you wake up with a headache and a mess to tidy up, and at least one resolution broken in the first twenty-four hours. This year, with guests to entertain, we decided the headaches had to be ignored. And the mess: we decided to leave it behind. But where to go? New Years Day was both a Sunday and a bank holiday. Northern France was closed for business. Not a museum or a restaurant to be visited. 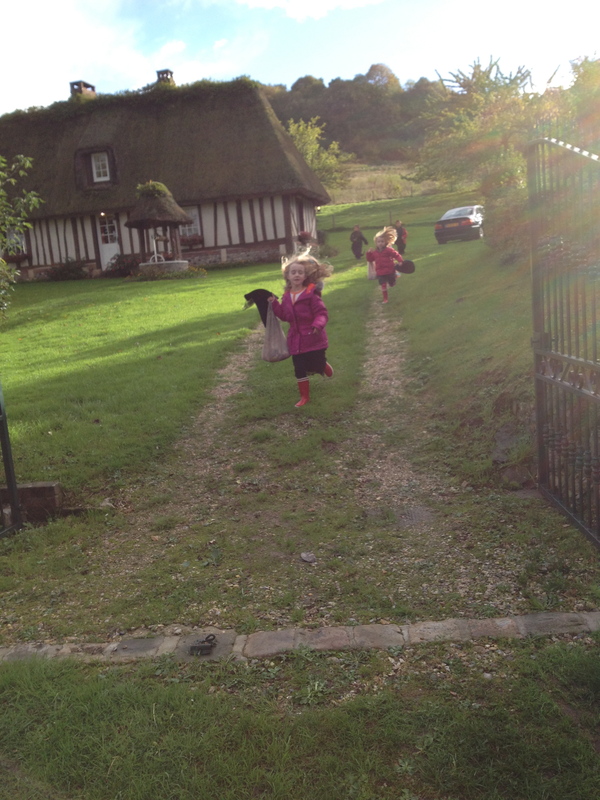 There were many small children in our party, so a walk in the forest wouldn’t be easy. That left the beach. Perfect. 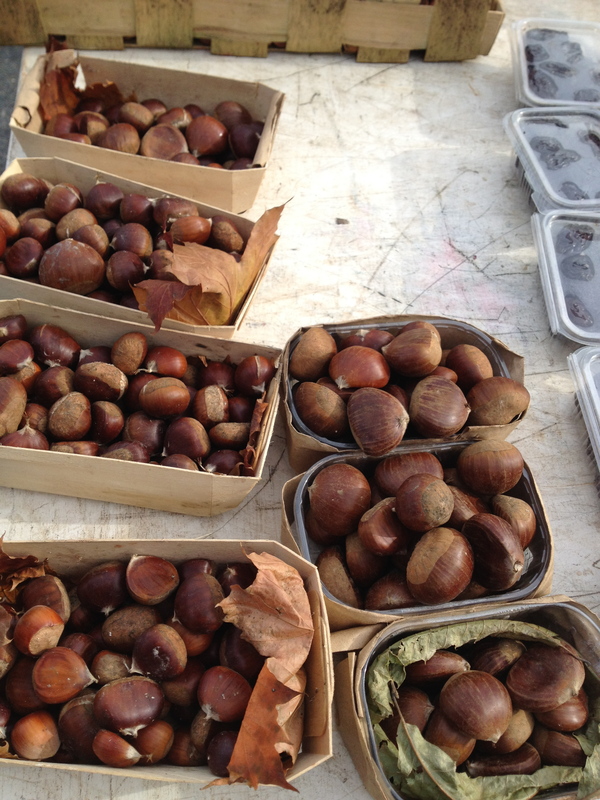 Lovely market pictures and a meditation on the pivotal role that grandmothers play in French food culture. The Christmas tree sellers are out in force this weekend, and doing a brisk business. 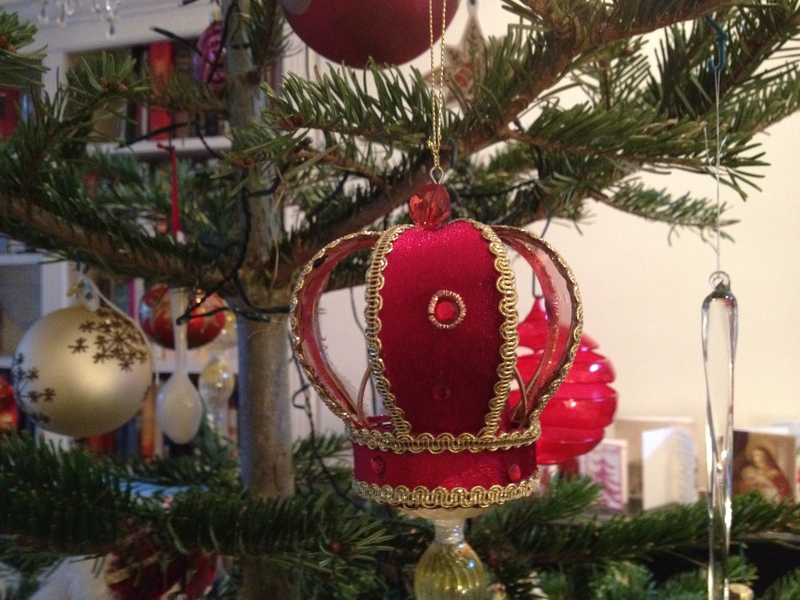 Here’s what I wrote about Christmas tree decorating last year. Not much has changed in the intervening months: it wasn’t a year for far-flung travel for our family. 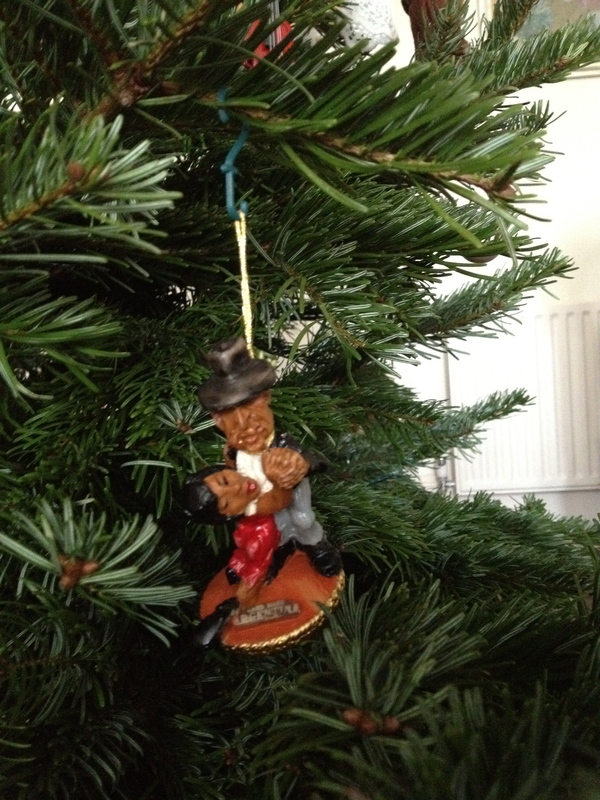 The only new tree decoration is a traditional Romanian straw hat bought with spare change on the way out of Cluj. And still, there are no French decorations. 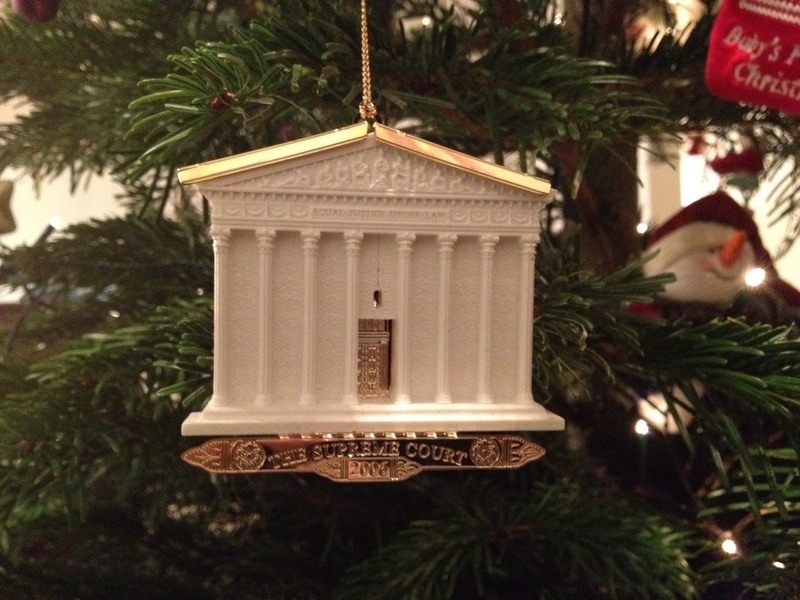 When traveling for pleasure we like to find local decorations for the Christmas tree. It’s a way to remember some of the interesting places we have visited. It’s also a great excuse to buy tourist tat without making seriously expensive mistakes. My parents did the same, and their tree is heavy with adventures. My favourite is the wooden cosmonaut they picked up at Moscow airport in 1971. 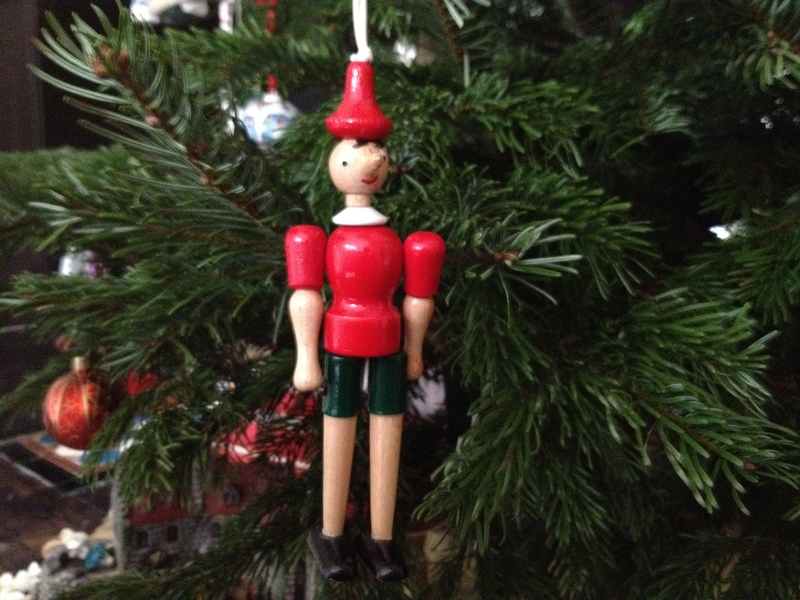 He hangs on the tree, a reminder of a vanished era of aspiration and confrontation. 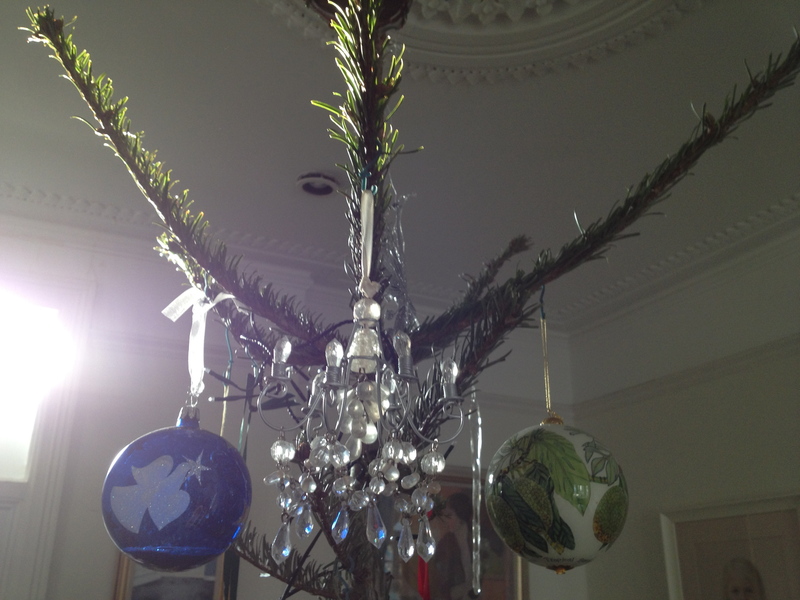 Here are some of the decorations on our tree this year. This glamorous shopping lady is from Colorado. She has always struck me as overly stylish for the Rockies–perhaps she is taking in the après ski scene inAspen. We found the hand-made lace angel next to her in Tallinn, Eastonia. Tallinn’s old town is beautiful and perfectly sized for a weekend visit if you can just manage to avoid the stag party crowds. The tango dancers are from Buenos Aires, where we watched equally craggy dancers dipping and spinning around the streets of La Boca. 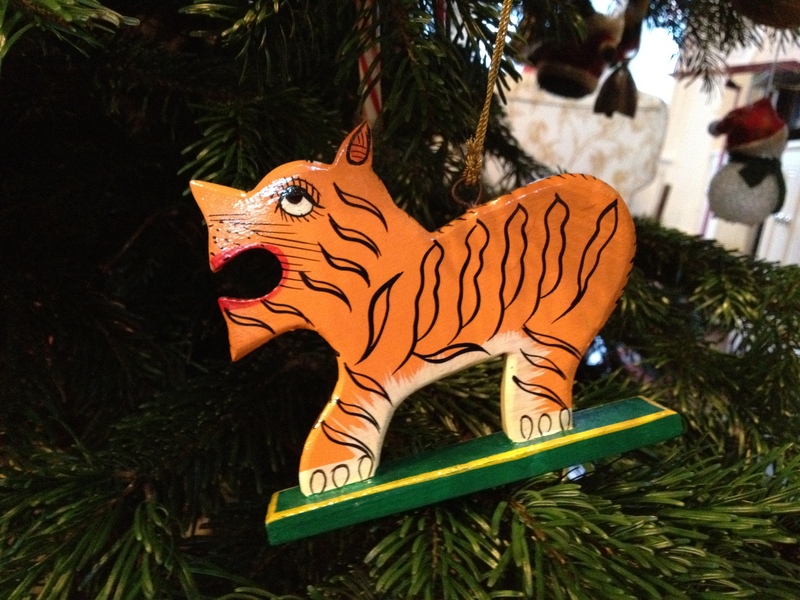 I wonder if the Bengal tiger is wearing lipstick, or is that the remains of dinner around his mouth? He roars fiercly at the snowmen and santa decorations. We found the sweet-faced Pinnochio in Orvieto, a hilltown in Umbria, Italy. When I lived in Italy as a child I worried through Christmas that the old witch Befana who visits on the Ephiphany would bring me the coal that naughty children get instead of gifts. 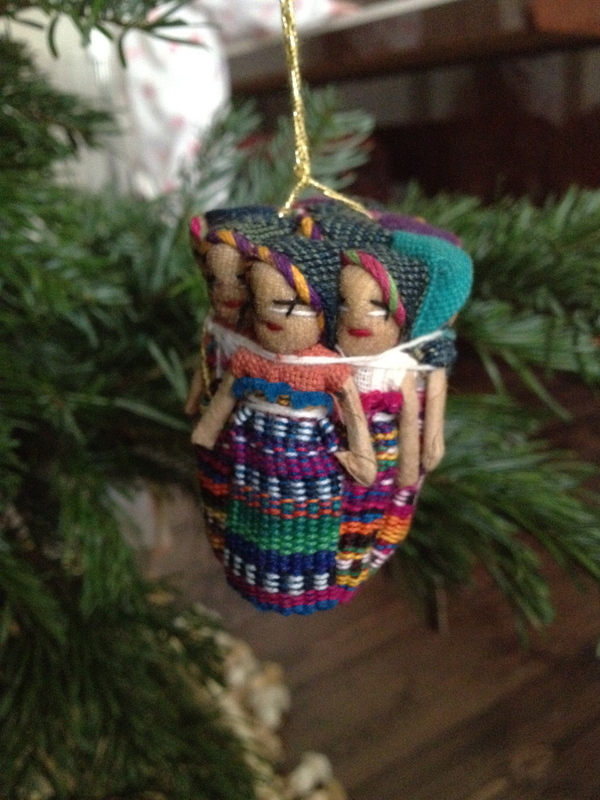 The little ladies are from Guatemala, where we marveled at the Mayan ruins in Tikal. In Iceland we stayed at the isolated Hotel Budir on the Snaefellsnes peninsula. No vikings in sight there, but it was easy to imagine elves emerging from the mysteriously shaped lava rocks all around. This crown above and the chandelier below are English, from the Victoria & Albert Museum shop which sells unusual and unique Christmas decorations. 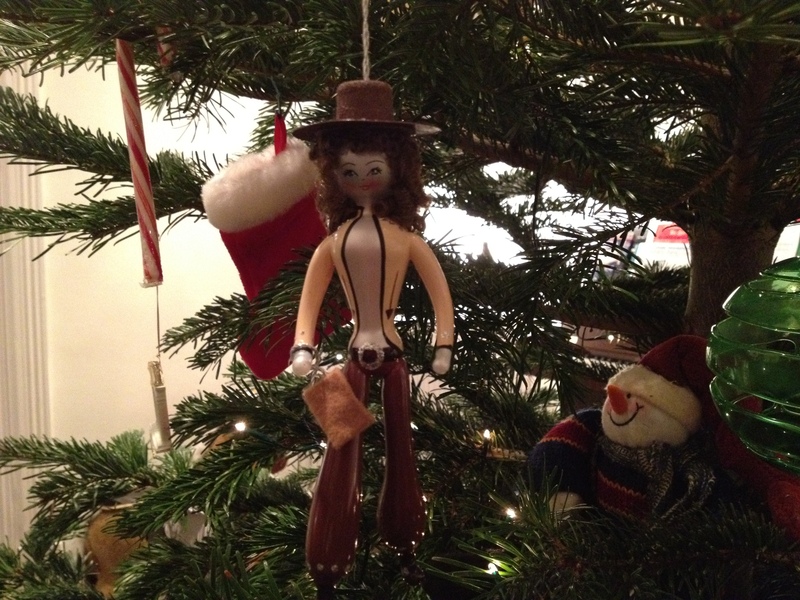 The cowgirl is from Texas and I love her sparkling belt buckle. I’m not sure she does much cow herding in this outfit: maybe Daddy owns an oil well. My brother clerked for a time at the Supreme Court, and he arranged for us to take a tour and hear the justices hand down a decision. It was amazing to be there and watch history in motion. The blue Matisse blue bulb is from MOMA, New York and the green bulb is from Hawaii’s National Tropical Botanical Garden. We think of the tree a work in progress, with many gaps to be filled. There is one gaping hole that I’d like to fill quickly. We spend so much of our time in France and yet have nothing to put on the Christmas tree. 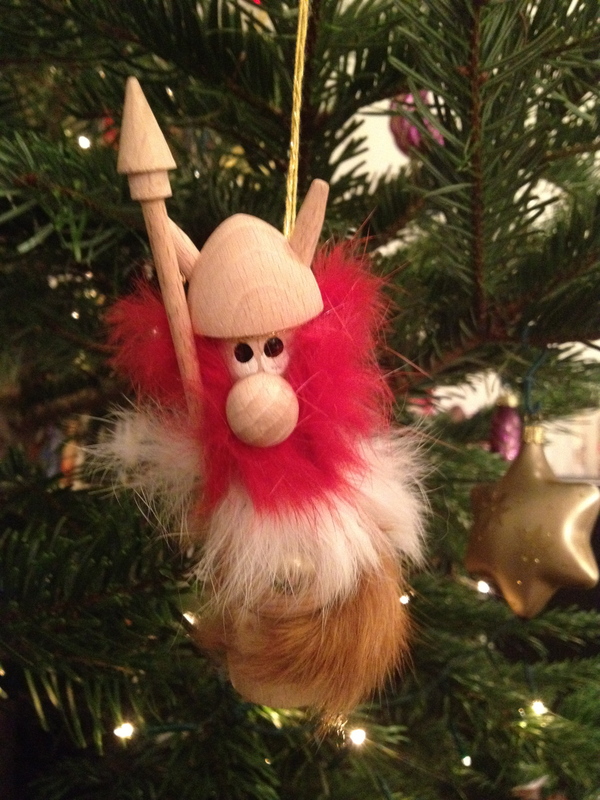 So please help me – where is the best place in Paris or Normandy to find Christmas decorations? 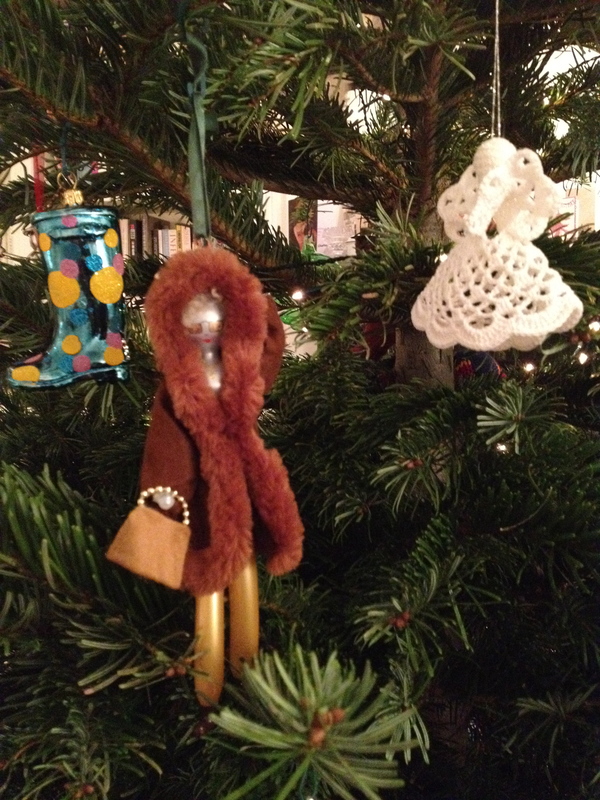 And what are the most typical French Christmas tree decorations? I’d love to see these designer Christmas “trees”, on display at the Hôtel Salomon de Rothschild from 3-9 December before being auctioned off at a benefit gala to raise money for charity projects. Each year Les Sapins de Noël des Créateurs (roughly: Christmas Trees of the Designers) sees big names in fashion, design and architecture creating their own take on the traditional Christmas tree. Ali Mahdavi, Christian Ghion, Damien Da Rocha, Diane von Furstenberg, Dior, Dsquared2, Elie Saab, Esmod, Hervé Van der Straeten, India Mahdavi, Jean-Charles de Castelbajac, Jean-Claude Jitrois, Jean-Jacques Ory, Jean-Paul Gaultier, Les Garçons, the House of Lesage, Louis-Marie de Castelbajac, Louis Vuitton, Magnum with Chantal Thomass, Maison Martin Margiela, Mathilde Ecotais, Maxime Simoëns, Olivia Putman, Patrice Keep, Philippe Soussan, Pierre Hermé, Rachid Khimoune, El Salvador Dali perfume, Smalto, Sonia Rykiel, Stella McCartney, Tsarina with Manoush and Wooyoungmi. 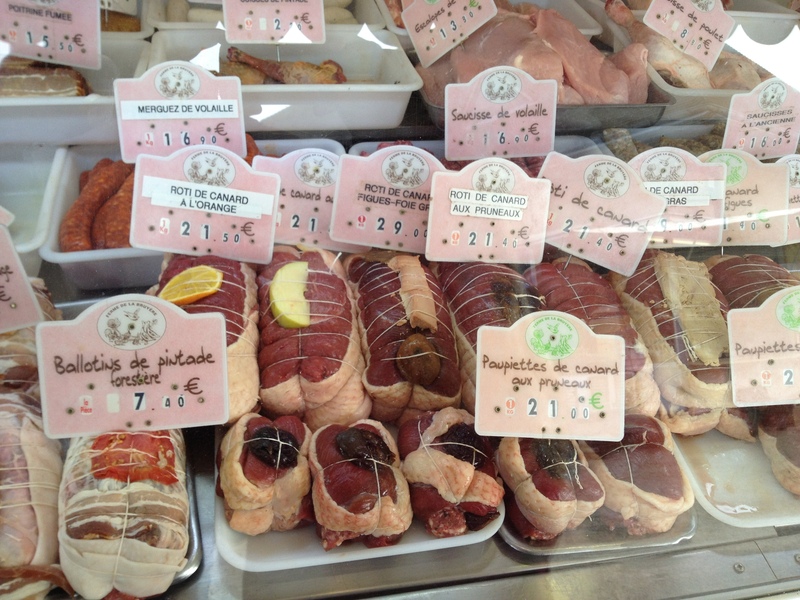 One of the joys of spending time in Normandy is visiting the area’s bountiful food markets. Our local market, held on a Friday, never disappoints: but in those weeks when we’re traveling or otherwise occupied on a Friday, a close second best is exploring the other markets of Upper Normandy and Calvados. 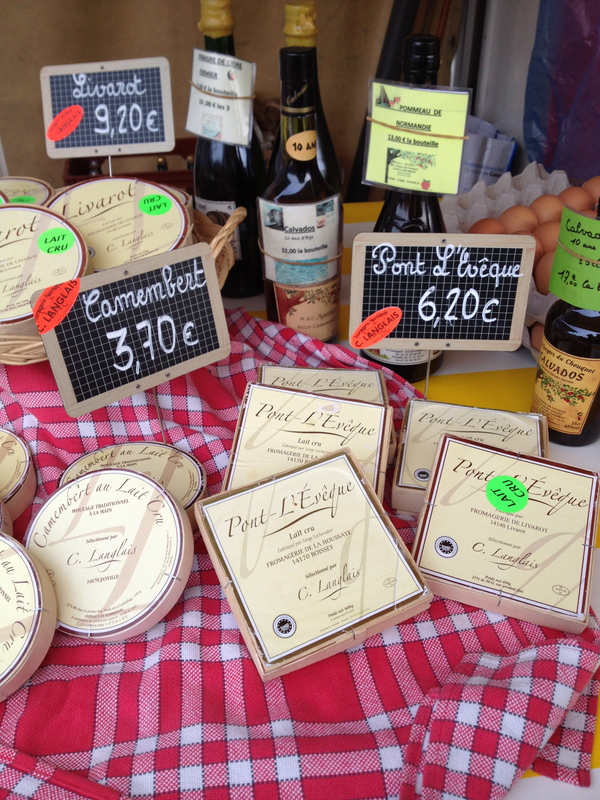 This month we made our way to Pont-l’Évêque, where the weekly market is held on a Monday. 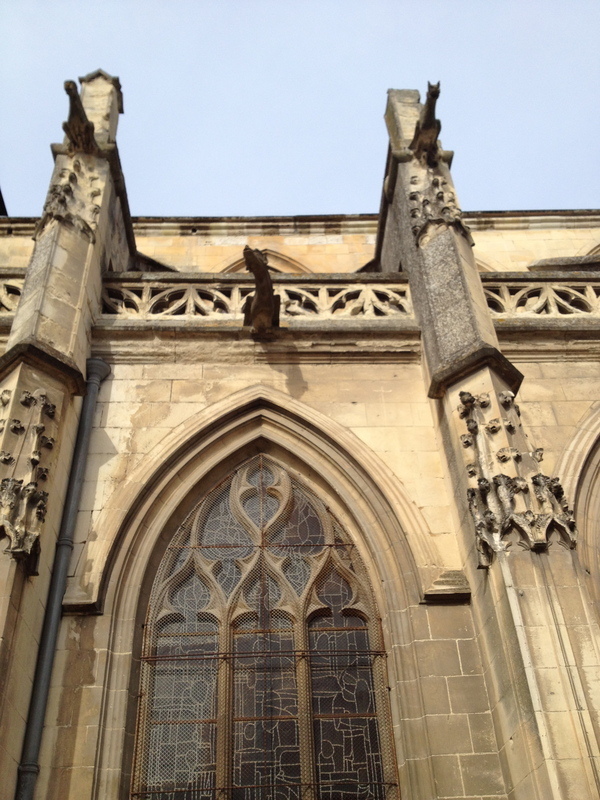 It’s home to the eponymous cheese, and to a lovely church which survived wartime bombing. The point of local markets is they change every time. 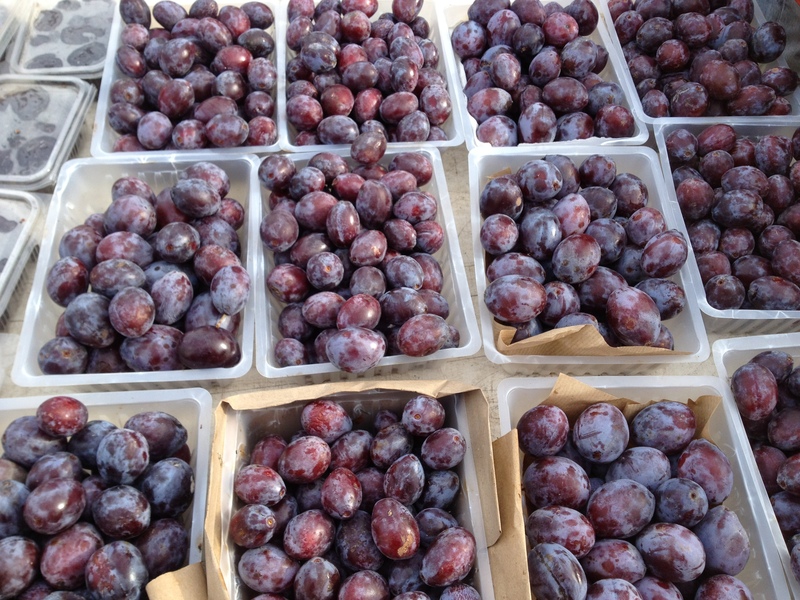 You go for the seasonal produce and for the individual sellers. It’s the opposite of supermarkets, where it’s downright inconvenient when the aisles are changed around adding a precious few minutes to your already too-long shopping time. 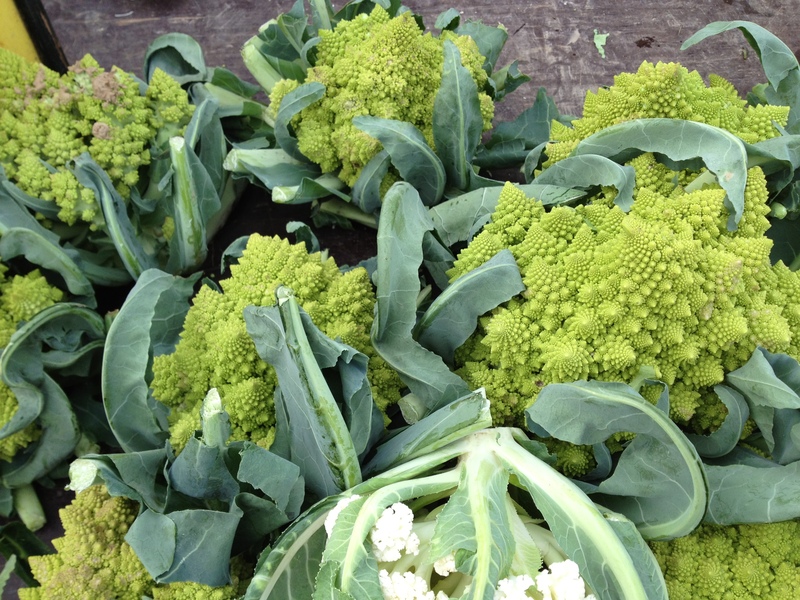 In the first week of November, there were chestnuts, quinces, and the alien-fabulous chou romanesco. I’ve never cooked any of these, although the guests at our cottage the week before had collected chestnuts in the forest and roasted them over the open hearth. I’ll have to try that, and here’s how. I love these pre-prepared bundles of meat: so lovely and neat and easy, the original, organic, guilt-free ready meal. 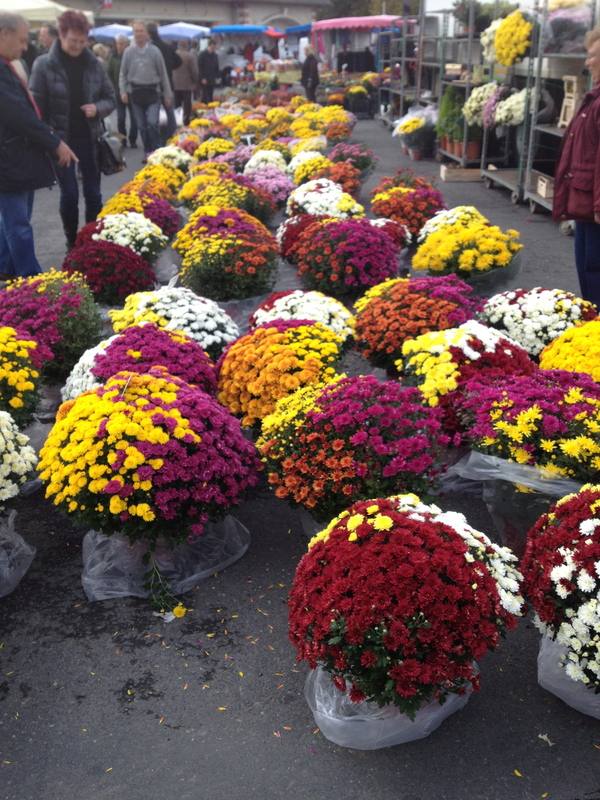 And the chrysanthemums were flying: you could see them lining the village streets, and all around around the cemeteries where families were marking November 1st, a day of remembrance. We left some by the cottage gateposts: I wonder how far into the winter they’ll last. The significance of November 1st may be all but forgotten, little more than a hangover after the revelry of Halloween, in many places. 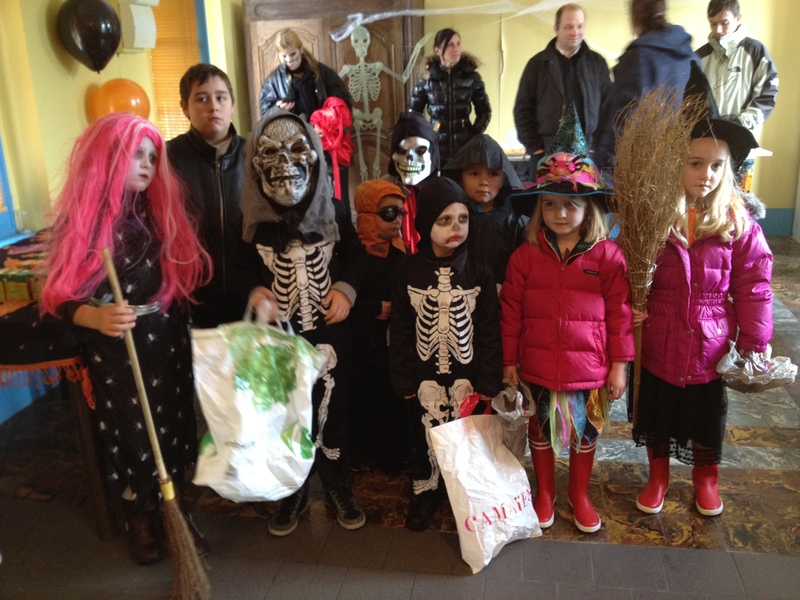 But in France–where Halloween is observed as a holiday only for children—it’s Le Toussaint, All Saints Day on November 1st, that is widely marked. As one blogger explains, it’s a holiday when everyone goes home to be with their family and remember their loved ones who have died. So it felt just right to mark 1st November this year with a family meal. We were joined by friends we’d not seen much in recent years, since they moved away from our London neighbourhood back to Paris with their four children. To mark the occasion I made Susan Loomis’s hearty lamb stew from her memoir-cookbook about moving to Normandy, On Rue Tatin: The Simple Pleasures of Life in a Small French Town, followed by David Lebovitz’s ever reliable Chocolate Mousse I from The Sweet Life in Paris: Delicious Adventures in the World’s Most Glorious–And Perplexing–City. 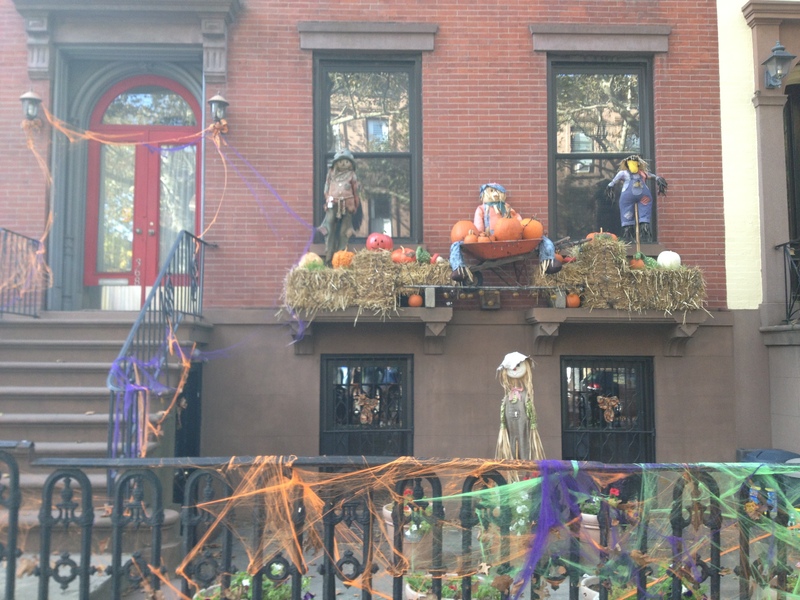 Something dreadful happened in the village this year. I’m not ready to write about it yet, may never be. 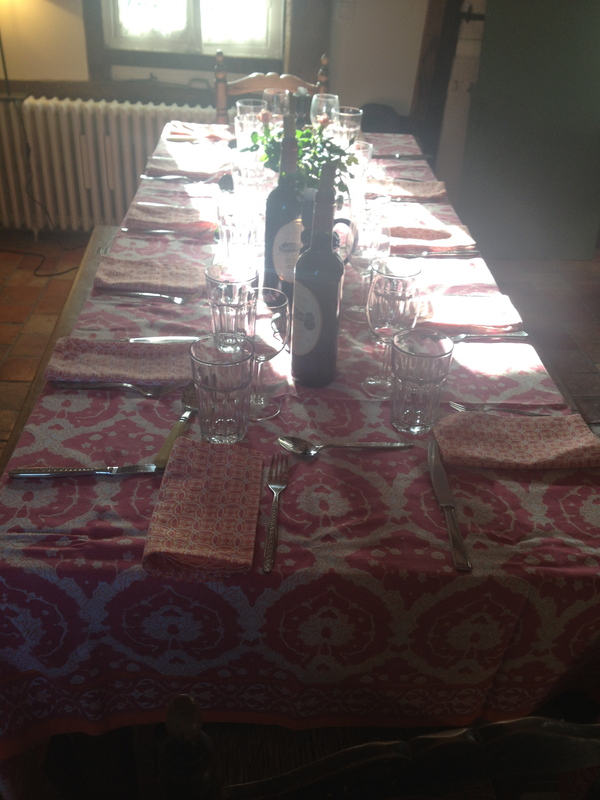 It gave some peace and much-needed pleasure to prepare and then eat together at the cheerful looking table; to take a postpandrial walk in the woods together; to share with friends the downs and ups of busy lives in our different cities. It was indeed a day to remember, as well as to celebrate the lives we have. I was lucky enough recently to spend a few days in New Jersey, before the hurricane hit. 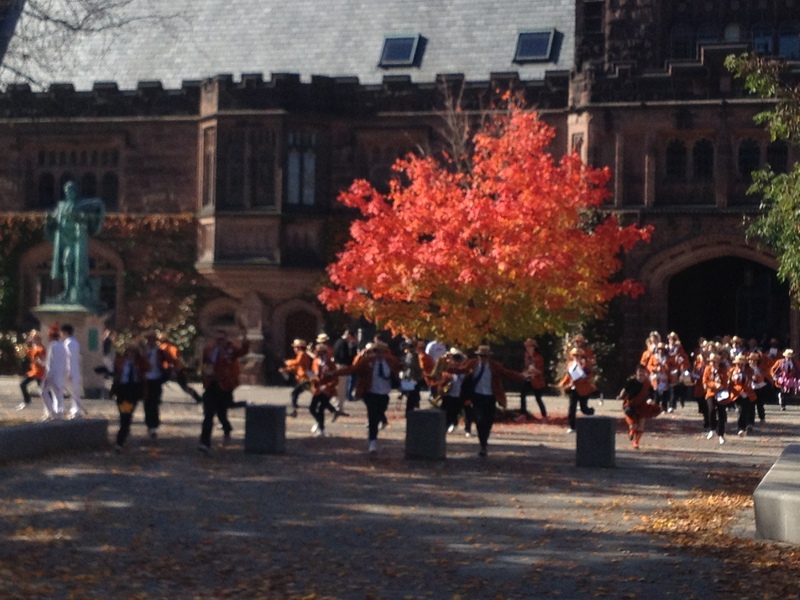 The trees were magnificent in their autumn colours. 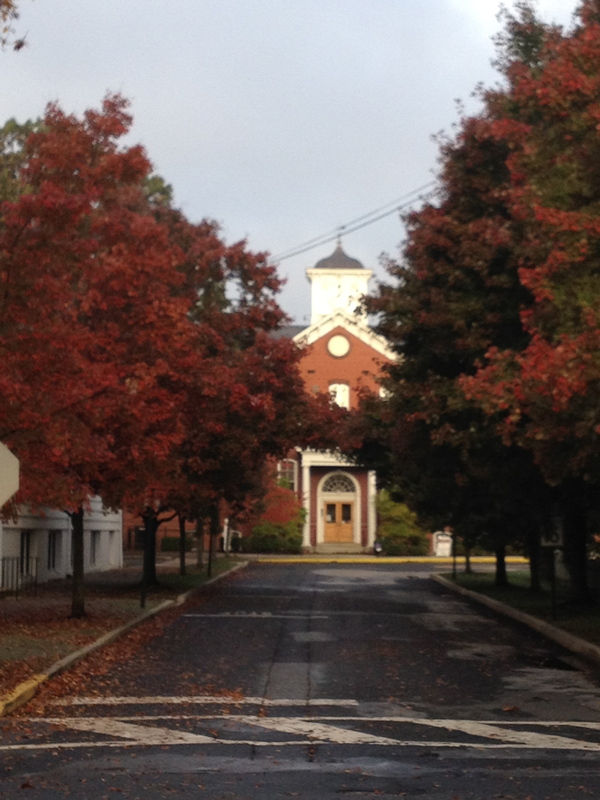 I had forgotten how heartbreakingly beautiful an East Coast autumn can be, all flame red trees and bright blue skies.The town I stayed in (home to a lifetime friend and writer who blogs wonderfully at New Jersey Seoul) was dressed for the season, all orange pumpkins against white clapboard, as New England as you can get. 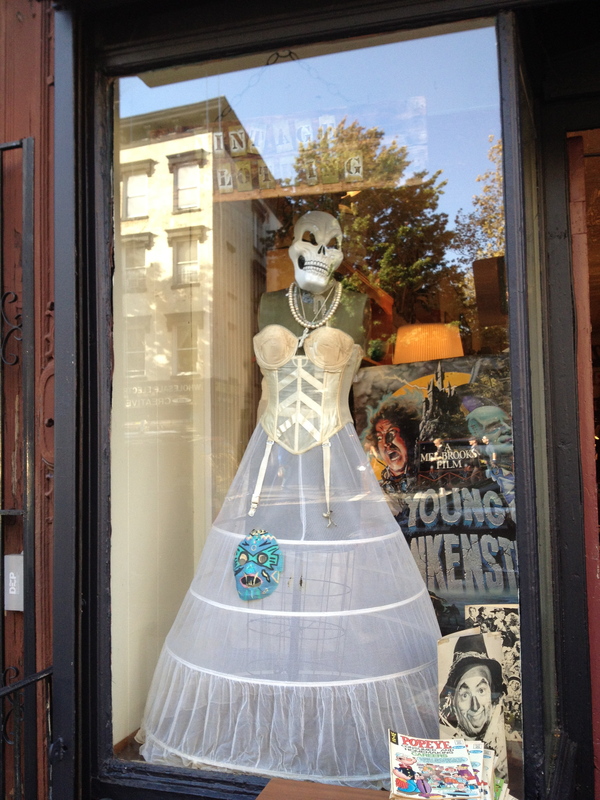 I then spent two days in the trendiest part of Brooklyn which was, in its own way, dressed for Halloween. This delighted me, because I would spend the following week, including Halloween, in Normandy. What kind of Halloween could you expect in a rural village that’s about as far away as you can get from a Starbucks in the developed world? In fact: a very normal Halloween. 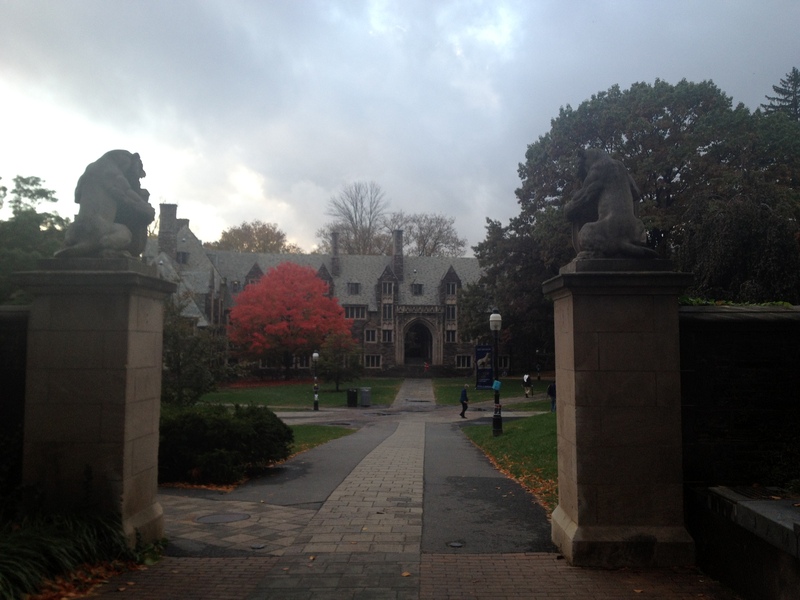 The houses were dressed for Halloween. 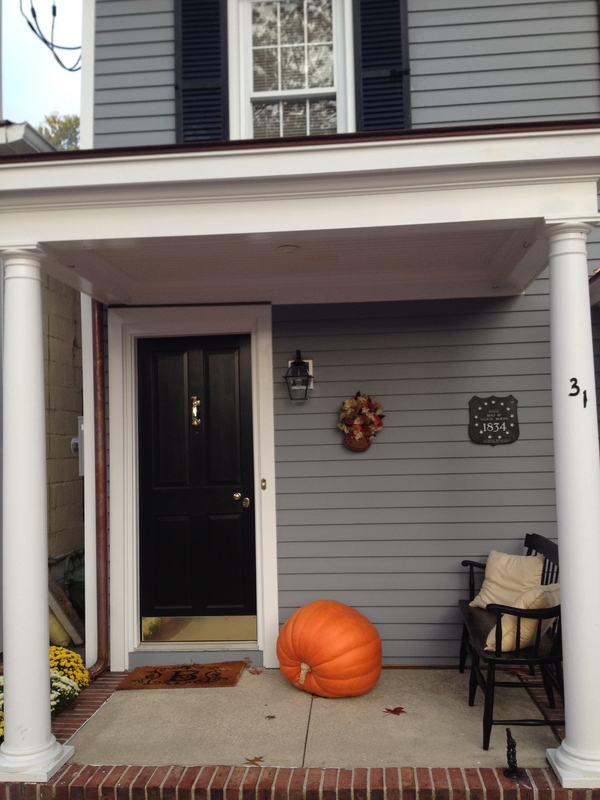 There were even pumpkins. I should have known. Which country, after all, did Cinderella come from. There were few differences. First, it’s for the little children. There’s none of the adult-dressing-up stuff, and none of the wild tricking you get with teenagers in the US. (Although just after I left New Jersey it wasn’t the teenagers, it was Hurricane Sandy that played the worst possible trick, was the Grinch that stole Halloween for a million candy-laden, powerless towns across the midlantic states). Second, it’s a village-managed event, coordinated and strictly regulated. 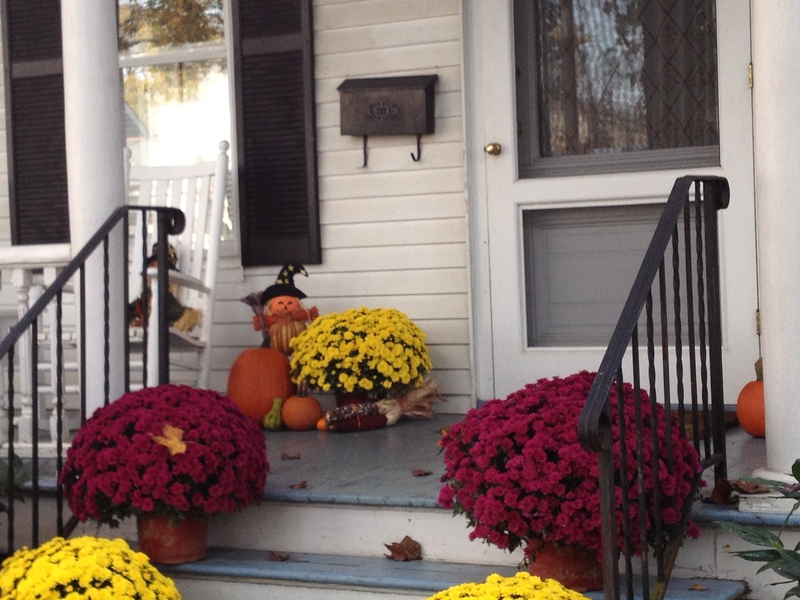 It happens on a day that’s convenient for the village (it may not even be 31 October!). 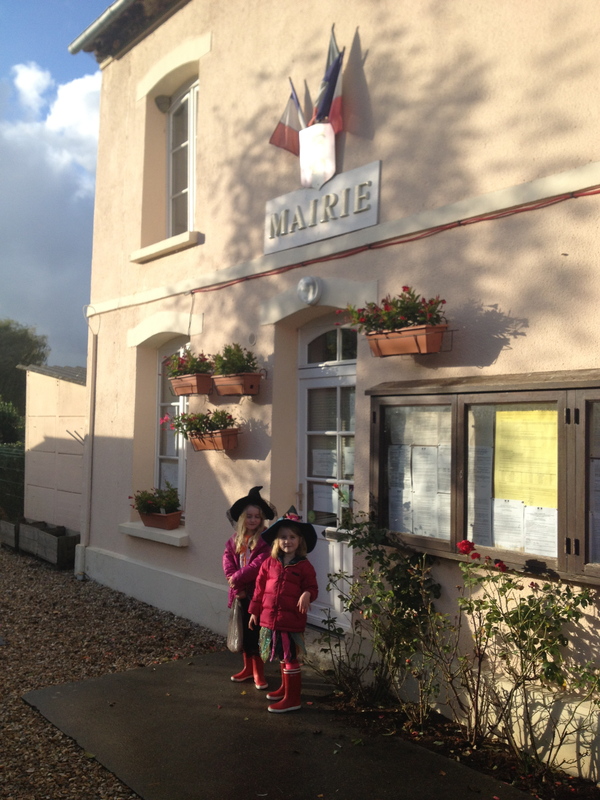 The children are invited to gather at the Mairie (town hall). 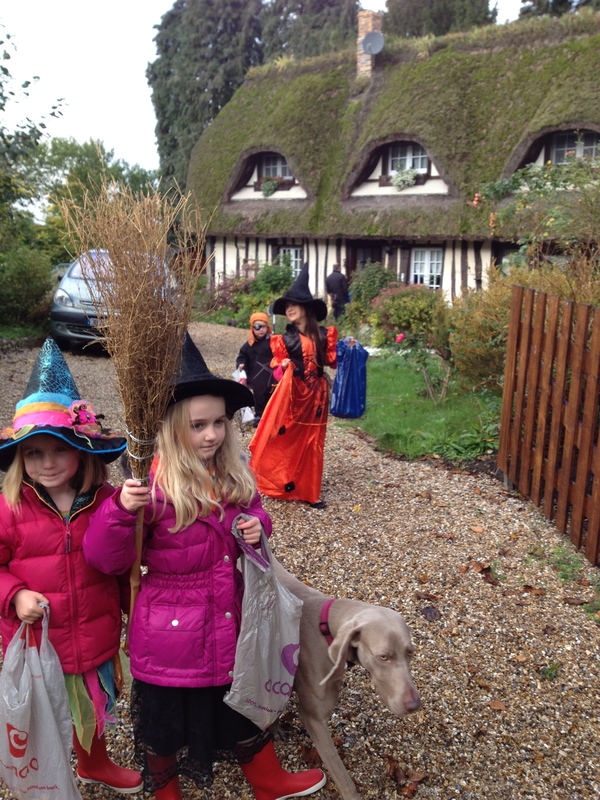 They will then progress around the village to collect their candy, politely thanking the householders and closely monitored by a legion of parents who afterwards gather for a reconstituting glass of wine in the village hall. I was sneaky, I confess. I had brought back from the US a bag of American candy: Taffy and Nerds and Sweet Tarts. What’s this? cried the children, seemingly disgusted. But the basket was nearly emptied, and my children told me that it was the American candy (below right), not the beautiful French candy (below left) that went first as the children gorged themselves afterwards. Some things remain the same, wherever they happen.